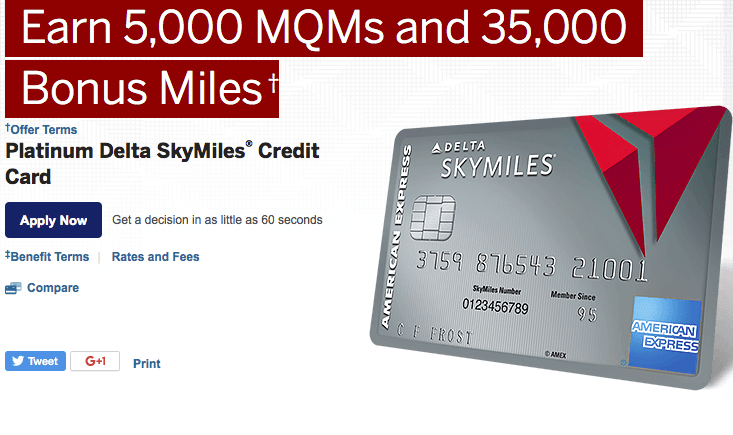 Who Is the Platinum Delta SkyMiles Credit Card From American Express Good For? If you fly on Delta and are trying to reach or maintain elite status, the Platinum Delta SkyMiles card can be a great tool. This premium card offers a sign-up bonus that includes Medallion Qualification Miles (MQMs) that count toward elite status. Although the Platinum Delta card does come with a higher annual fee than both the basic and Gold Delta SkyMiles cards, it offers a greater potential for earning miles, with a slightly higher sign-up bonus, as well as the ability to earn more bonus miles if you spend more. You can use Delta SkyMiles to book flights on Delta, as well as on 20 other partner airlines, most of which are SkyTeam alliance members. In addition to flying comfortable jets that offer excellent customer service, Delta is the most punctual domestic airline, with the best on-time performance among the big three. The current sign-up bonus is 35,000 miles, 5,000 of which are MQMs and count toward elite status. You have to spend $1,000 in three months to get the bonus. You’ll also get a $100 statement credit after your first purchase. If you spend $25,000 in the first year, you’ll get an additional 10,000 miles, all of which can be applied toward elite status. If you spend $50,000, you’ll get another 10,000 miles, which are also MQMs. So, if you spend enough, you can get a total of 55,000 miles, 25,000 of which are MQMs. That’s enough for Silver Medallion status, though you’re also required to spend at least $3,000 on Delta flights. There have been better sign-up offers in the past, though, including a 60,000-mile bonus that you can earn in the first three months of having the card. It may be worth waiting to see if it’s offered again. Delta usually has excellent award seat availability to Europe, Asia and Australia, even during peak travel times. That includes good availability in business class. In addition, Delta has strategic partnerships with some of the best airlines in the world, like Virgin Atlantic, Virgin Australia and Korean Air. It’s also worth noting that there are no fuel surcharges on Delta flights not originating in Europe, or on most of the airline’s partners. It can be difficult to find the cheapest economy rate on some popular domestic routes. However, Delta recently started offering discounted rates on select short flights in the U.S. For example, it’s possible to get a round-trip flight between New York and Charlotte for only 20,000 miles, instead of the standard domestic redemption rate of 25,000 miles.